If you are working on the history topic, The Great Fire of London, be sure and visit Fire of London.org . The site was created by The Museum of London, in partnership with The national Archives, London Fire Brigade Museum, National Portrait Gallery, and London Metropolitan Archives. The site features an interactive story in game format that may be played on the IWB for whole class teaching or used on individual computers. 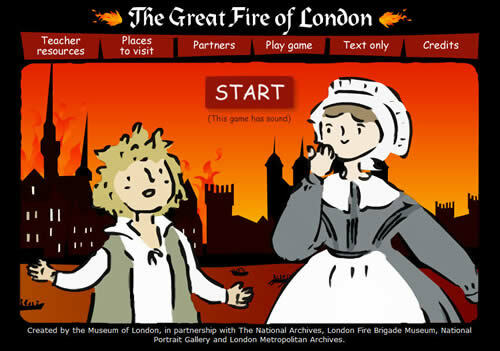 The game is an incredible learning tool that provides a great deal of information about the fire and the rebuilding of London based on historical evidence. Throughout the game, the children are asked, "How do we know?" and look at artifacts to help make decisions. The site also has an image bank, lesson suggestions, extension activities and links to other sites. The Year 2 children I used this game with enjoyed it so much that they asked for the web address so that they could play it home. Of course this site is not for early years, but I have been known to also teach in Key Stage 1 and wanted to share!